Yesterday we decided that we didn’t want to rush the sightseeing, so we booked an extra night at the hotel. Our room (twin) was already booked though, so we had to move to a double room instead. After sending an inquiry for a 3 day Mekong river tour ending in Ho Chi Minh City, we packed our bags and left them in the room. We found a tuk tuk to take us to the Killing Fields and Tuol Sleng (S-21), and actually confirmed the tour from the tuk tuk a bit later (we have bought a local sim card for internet access). First we drove the 14 km to Choeung Ek, where the most famous of many, many killing fields in Cambodia are located. We had read some history before we arrived, but it was completely different to walk around the area where it all happened, and listen to the stories of the survivers on the audio guide. There were quite a few visitors, but hardly any talking. People walked slowly around the area, taking in the stories, looking at the mass graves and the remains found. Several people left colorful bracelets around the mass graves to show their respect for the victims. We were also told to stay on the paths and watch where we were going, because when it rains clothes and bone fragments are still coming to the surface. From 1975 to 1979 the Communist Party of Kampuchea (known as Khmer Rouge) was the ruling party in Cambodia. Their goal was to transform the country into a peasant-dominated communist society, self-sufficient even in the supply of medicine. This led to a widespread famine, and thousands of people died from treatable diseases like malaria. Around two million people were forced to leave the cities to become farmers in labor camps, where several died from hunger and exhaustion. 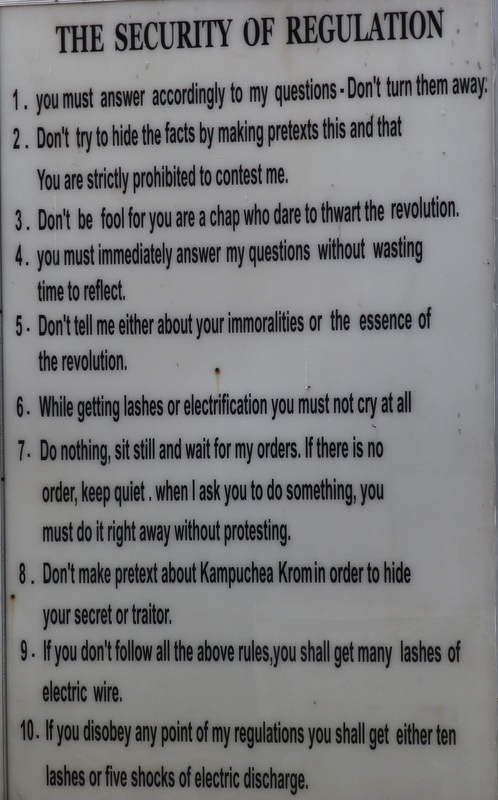 In addition the Khmer Rouge tortured and killed “intellectuals” (everyone with an education, all English-speaking people and people wearing glasses), suspected capitalists, city-dwellers, people with connections to the former or foreign governments, minority groups, anyone participating in religious rituals, possible traitors, people trying to escape and anyone not following the rules (by picking wild berries for instance). The leader, Pol Pot, said “It’s better to kill an innocent by mistake than spare an enemy by mistake.”. Around two million people (of a population of 8 million) died during the regime, about half from executions. 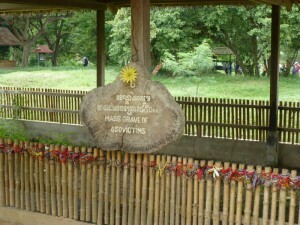 Several people were killed instantly, while the rest were taken to killing fields where they often had to dig their own graves before being killed. To save bullets they used farming equipment, sharpened bamboo sticks etc. as weapons. In some cases the children and infants of adult victims were killed by having their heads bashed against the trunks of Chankiri trees (to stop them growing up and taking revenge for their parents’ deaths). 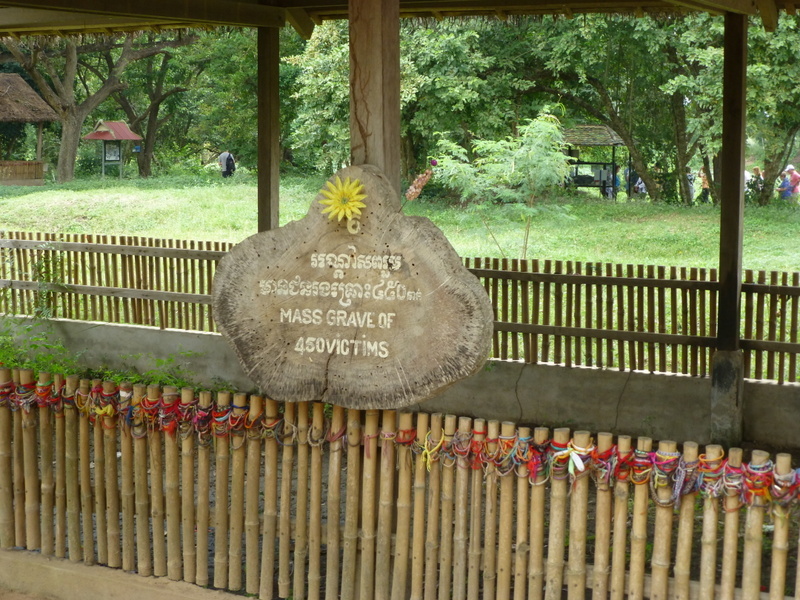 In the killing fields in Choeung Ek mass graves containing 8895 bodies have been discovered. The area has been made a memorial, marked by a buddhist stupa filled with more than 5000 human sculls, many shattered or smashed in. We continued to the Tuol Sleng Genocide Museum. The site is a former high school which was used as the notorious Security Prison 21 (S-21) by the Khmer Rouge regime. It was one of at least 150 interrogation centers in the country, and as many as 20,000 prisoners there were killed. Most prisoners were held there for 2 to 3 months and tortured into naming family, friends and neighbors, who were then arrested, tortured and killed. In the museum we saw the tiny cells the prisoners were held in, pictures of hundreds of prisoners (several of them just kids) and lots of terrible torture devices. The torture system was designed to make prisoners confess to whatever crimes they were charged with. Prisoners were routinely beaten and tortured with electric shocks, searing hot metal instruments, cut with knives, suffocated with plastic bags, got their fingernails pulled out etc. In the gallows they hung the prisoners upside down until they passed out, then dipped their head into a jar of fertilizer water to wake them up and continue the interrogations. In addition sleep deprivation, hunger and diseases helped force them to confess to the most absurd accusations. For the first year of S-21’s existence, corpses were buried near the prison. 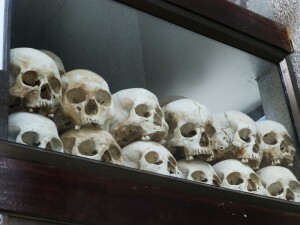 But they soon ran out of burial spaces, and the prisoners were sent to the killing fields of Choeung Ek instead. After an emotional day with lots of impressions to process, we needed a few hours back at the hotel. They had moved our luggage into a new room which was more or less a suite with a separate lounge area. They had put an extra bed in here, so it almost felt like we had our own bedrooms. After booking a hotel in Ho Chi Minh City, we went to the central market to buy a few things before the trip. The only thing we were not able to find was sunscreen. They only had sunblock and skin whitener… We had a couple of beers at the Frangipani Sky Bar, and then a great dinner at Khmer Saravan. For our last dinner in Cambodia we had to order our favorite Khmer dishes, Amok and Lok lok.